The Trump administration has been telling members of Congress that it plans to get a trade deal with Mexico before its new president is inaugurated in December, which it thinks will then prompt Canada to cut a deal. It would then move on to trying to make deals with other entities, like China and the EU. Between the lines: It's unclear whether this strategy will work, but it's also unclear what President Trump's tariffs will do to the economy and international relations in the meantime. What they're saying: The strategy hinges on Trump being able to strike a deal with Mexico's new president-elect, Andres Manuel Lopez Obrador, a populist who may be more open to a NAFTA deal. The administration recently said that it was "encouraged that they’d be able to come up with something sooner rather than later, that there’s incentives they think on both [Obrador] and on the current administration to try to get this done before he’s sworn into office," Senate Majority Whip John Cornyn told Axios. 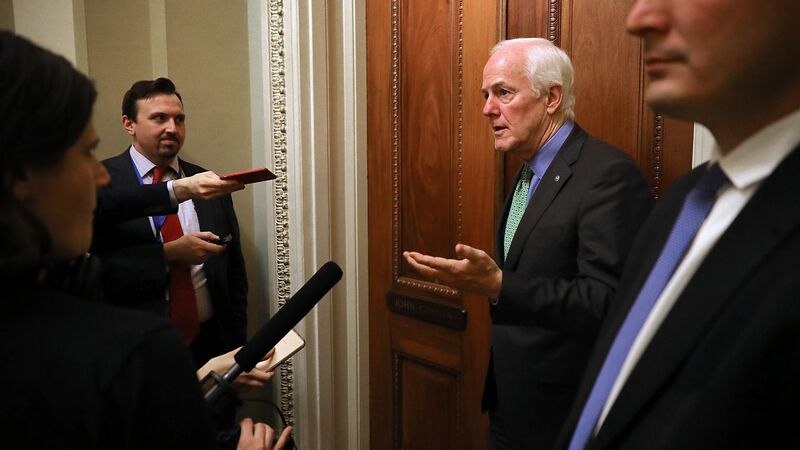 “It was a very general conversation, but it sounds like they’re thinking they need to get some of these issues off the table, because there’s so many of them, and the natural progression would be NAFTA and then the EU issues, maybe the 232 tariffs, particularly as regards our NATO allies, and then move onto the China front," Cornyn said. A senior Senate GOP aide said the idea was straightforward: "They think they’ll get Mexico later this year, and Canada will follow." Sen. Pat Roberts, one of the Republicans most worried about the administration's current trade policies, told Axios that U.S. Trade Representative Robert Lighthizer "believes that they can get agreement with Mexico, and obviously if that happens, hopefully we can make better progress with Canada. But I don’t know if that two-step works or not." Lighthizer's office declined to comment, but a senior administration official confirmed that the plan is to deal with Obrador before his inauguration, which makes it more likely that Canada will make concessions and close a deal. From there, it will move on to deals with others — Asian countries, China, the EU, etc. "I think they see [Obrador] as hostile to NAFTA, wanting to raise wages, and looking to create his own stamp on trade," another senior GOP aide said. Before the election, the economist who will lead NAFTA talks for Obrador said he too hopes a deal can be made in the next couple of months, but that the team agrees with Mexico's negotiating position under its current president, Bloomberg reported. Yes, but: There's a lot of anxiety on the Hill about the tariffs, and depending on how things play out, there's a chance Congress steps in before the administration cuts any new trade deals. "If very bad things happen in our economy I think the Congress might step forward. And there are bad things happening now, but it isn’t to the extent that we’ve seen the entire economy affected," Roberts said.